Cooking with a personalized utensil makes everything taste better! Not only will this utensil bring a personal touch to your kitchen, it's a great gift for weddings, housewarming parties, Mother's Day... the list goes on. Please leave the name you want in the ‘note to seller’ at checkout. 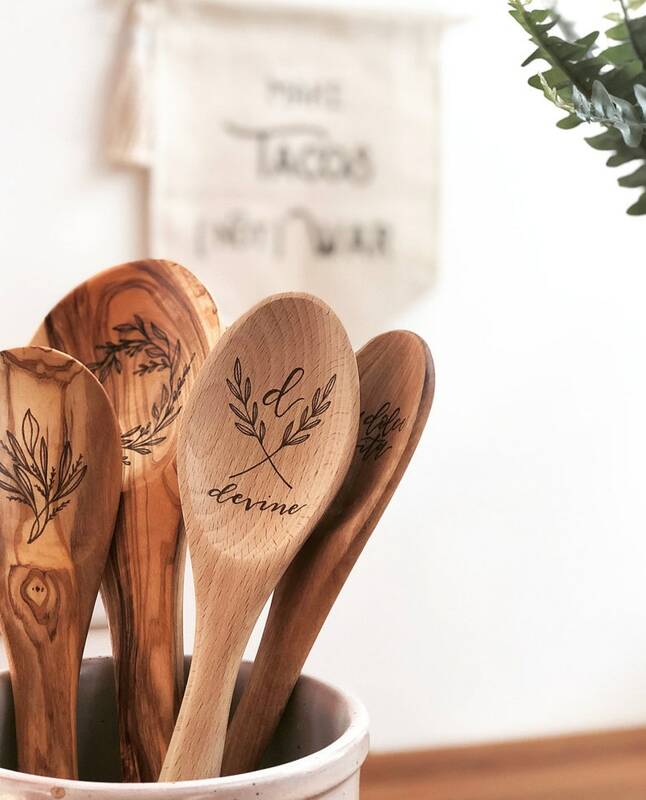 Each utensil is made to order, and is illustrated, lettered, and wood burned by hand. Photos shown are an example of what you will receive upon ordering. Because of the handmade nature of this item, yours may differ slightly from the photos. This kitchen utensil is made of solid beech wood and measures 12" in length. It has a heavy, quality weight to it when held and fits comfortably in your hand while cooking. I could not be happier with my purchase! I knew the spoons were going to be beautiful, but I was honestly blown away. These are going to make perfect gifts and I will definitely be purchasing again in the future. Thank you!! !